DALLAS – October 27, 2010 – Pizza Patrón, the nation’s number one Latin pizza brand, is thinking inside, outside and all around the box for a new way to steal market share. Currently, they are testing a $10 PAQUETAZO™ promotion in three markets that offers unprecedented value and is packaged in their new, portable ‘walking ad’ box that’s unlike any other. The Spanish word PAQUETAZO means ‘a great packaged deal’ referring to two or more items that are bundled and offered at a fantastic price. The full-color $10 PAQUETAZO box is bigger than your typical pizza box because it contains two medium pizzas (in boxes), a 5-piece order of BreadStix™ and marinara dipping sauce. 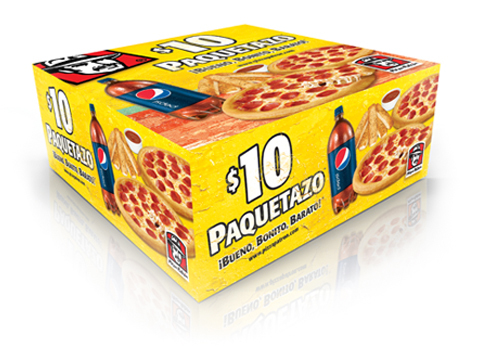 The $10 PAQUETAZO also comes with a 2-liter of Pepsi. After the three-market test, Pizza Patrón hopes to roll out the special nationwide, promoting it through various media ads in different markets. The marketing plan also includes a six-foot tall inflatable replica of the box that will be used on busy traffic corridors in some cities. “We’ve always been known for extremely good every-day values, but the $10 PAQUETAZO really stands out as a clear and memorable product offering that perfectly illustrates our commitment to provide the best food values in our industry,” said Gamm.